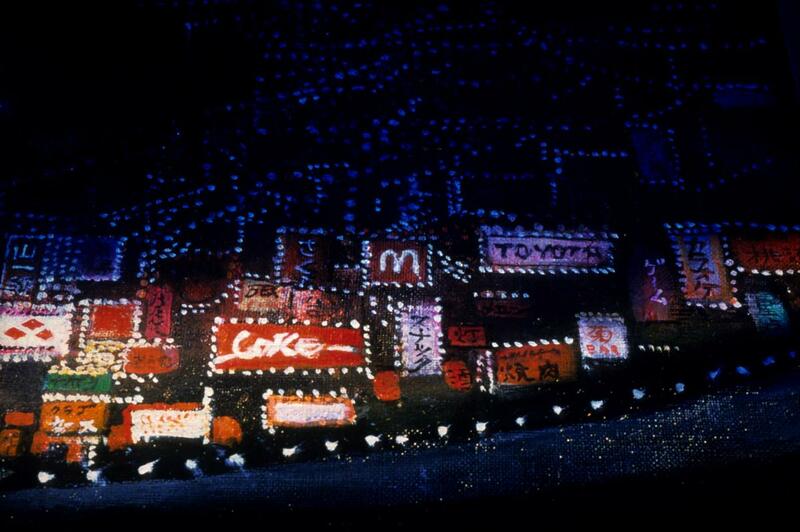 The metaphor of the trickster fox and image of the fox wedding were so powerful that Tomiyama retained and extended them in her next series, The Fox Story. This set of three oil paintings and several collages is predominantly pale pink and golden-yellow, making it visually quite different from Harbin. 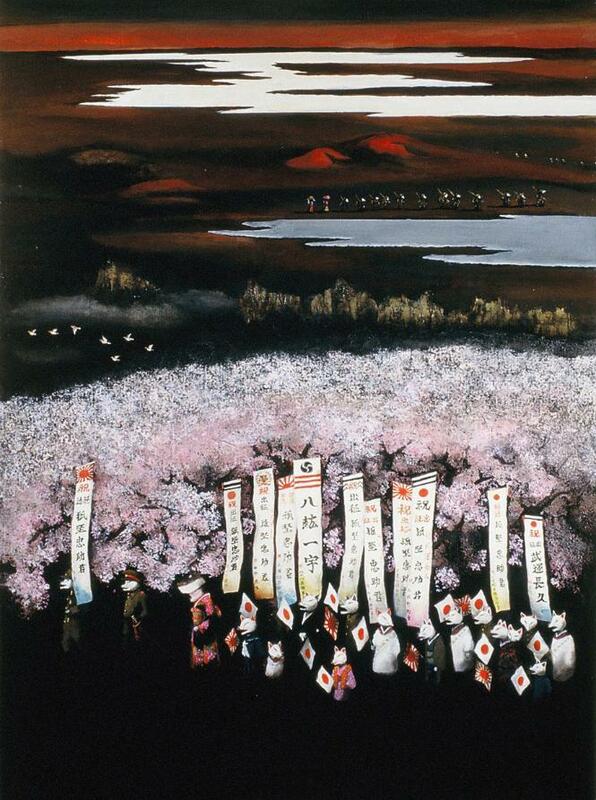 In addition to the fox, Tomiyama makes generous use of two classic symbols of Japanese literary and artistic culture, the cherry blossom and the chrysanthemum, both of which were given new meanings by the presurrender modern state. 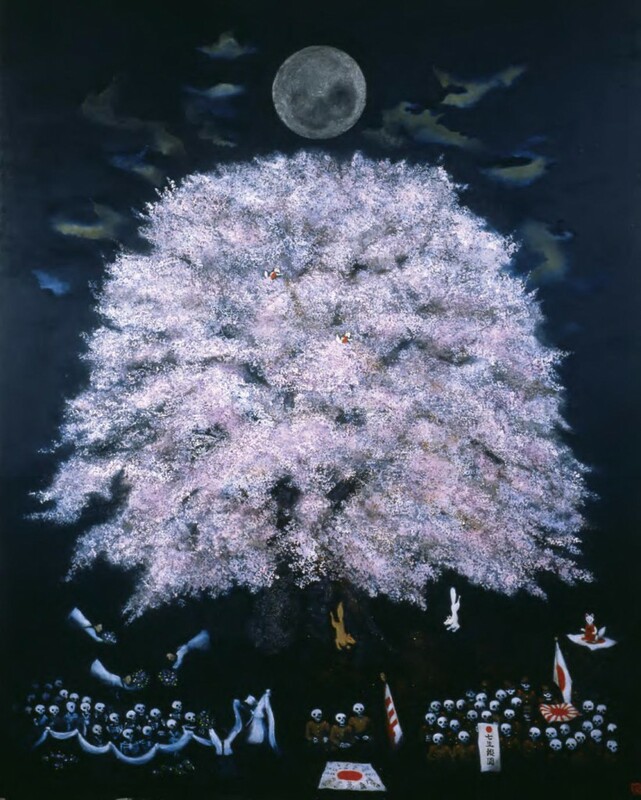 Because it has a very short life and is beautiful as it falls to the ground, the cherry blossom became the symbol of fallen soldiers in wartime Japan. 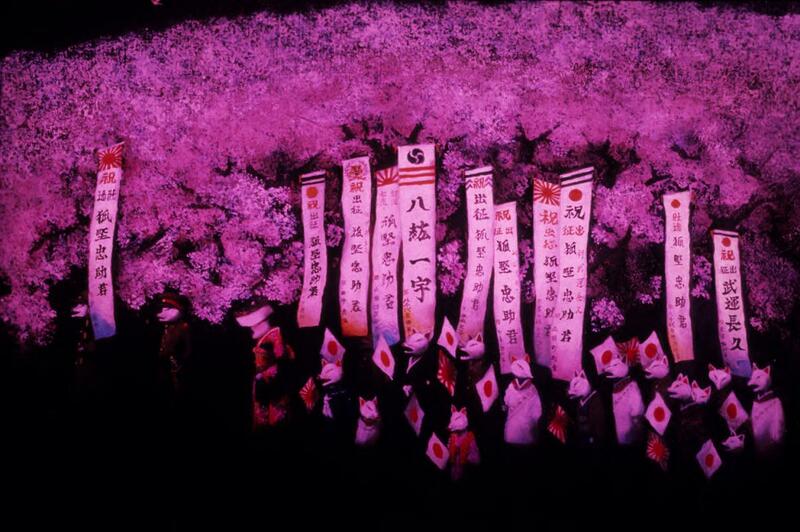 Young girls, for example, would wave branches of cherry trees when kamikaze pilots took off for their final missions. 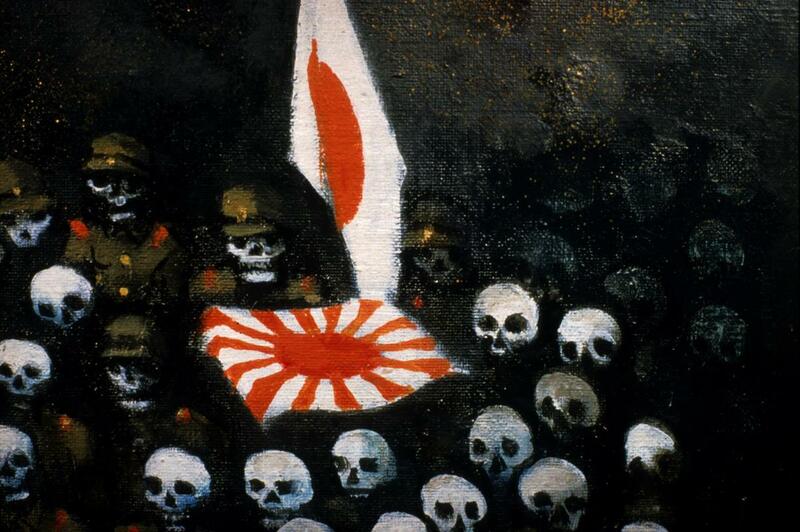 The central banner held by a participant in the wedding reads “Hakkō Ichiu,” or “Eight countries under one roof.” This wartime political slogan expressed the official view that Japan was divinely appointed to rule over Asia. 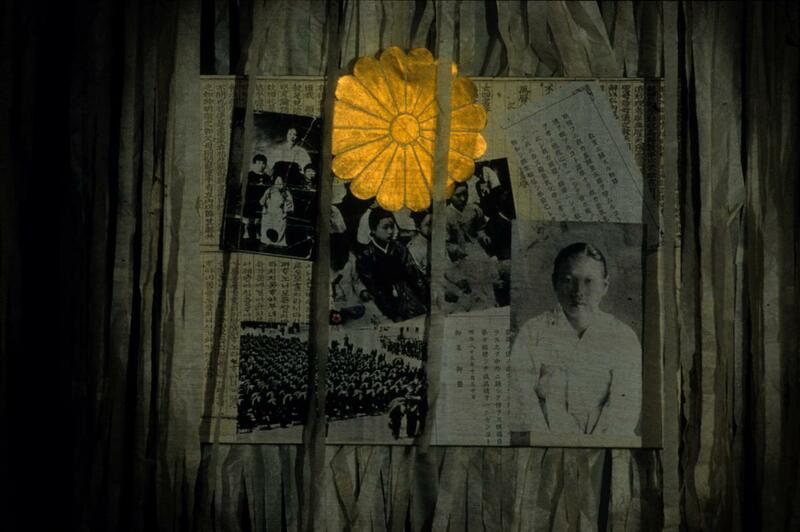 The golden chrysanthemum is the emblem of the imperial family. Tomiyama uses the theme of bewitchment to subvert the associations of these flowers, which in her hands become symbols of the callousness of the presurrender Japanese state toward the lives of its Japanese and colonial victims. 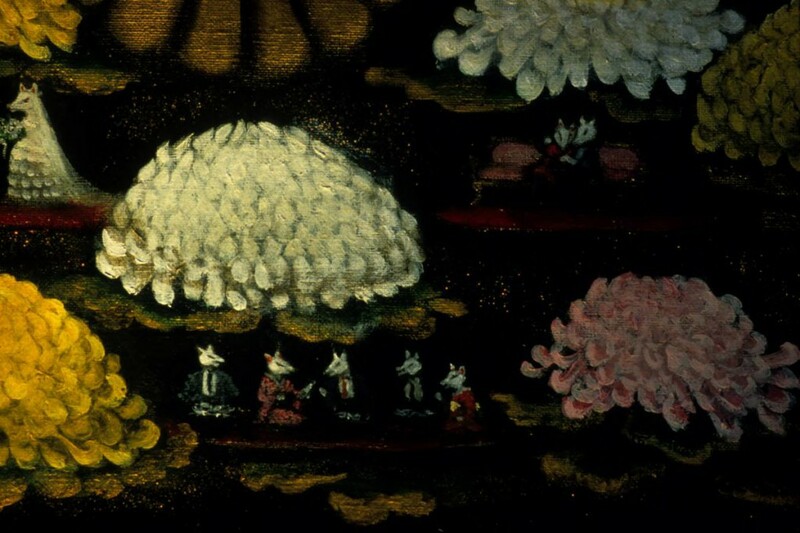 The third painting, “Illusions by Chrysanthemums,” only part of which is reproduced here, also includes scenes from postwar Japan, explicitly linking the attitudes of the present with those of the past, and asserts that foxes still live among us. 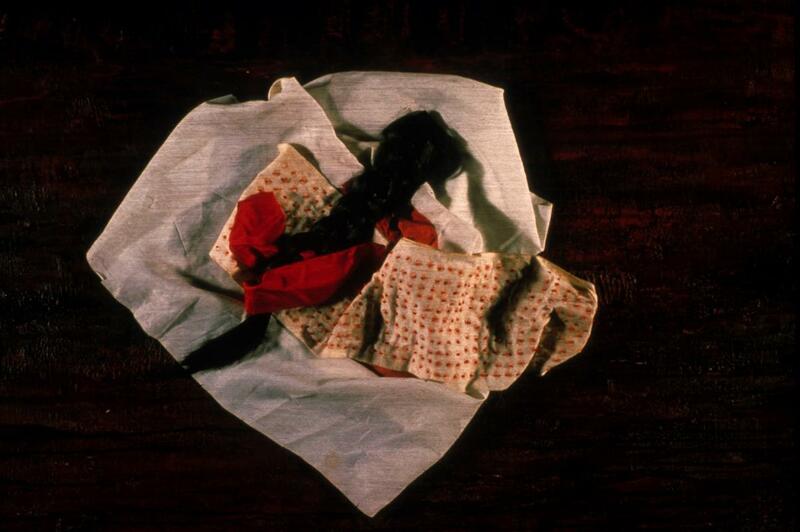 As with Memories of the Sea and Harbin, Takahashi Yūji composed music to accompany 80 photographs of portions of the oil paintings and collages in a slideshow/DVD performance piece. Seven of the 80 Fox Story images are included here. They show how Tomiyama and her photographer, KOBAYASHI Hiromichi, play with lighting, juxtapose paintings and collages, and choose portions of the large paintings to highlight. 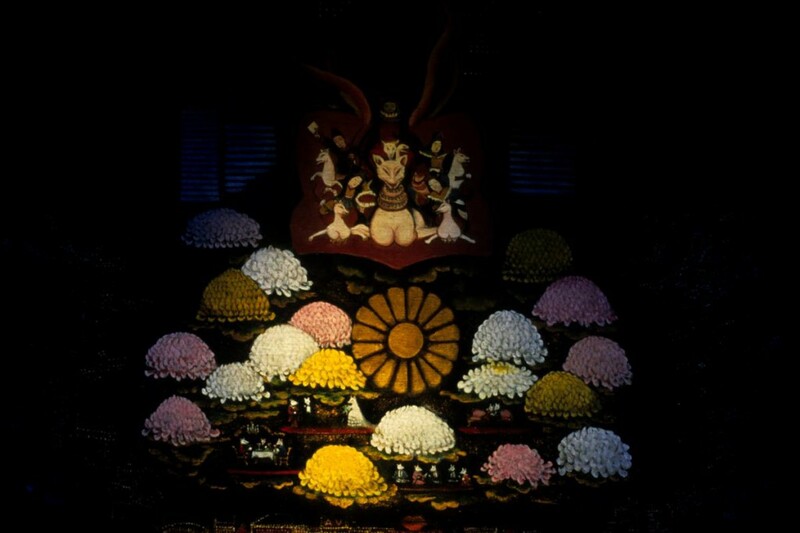 The scene of a formal betrothal party that is tucked away among the giant chrysanthemums is one such example. See Laura Hein, “Post-Colonial Conscience: Making Moral Sense of Japan’s Modern World” and Carlo Forlivesi, “A Fox Story–The creative collaboration between Takahashi Yūji and Tomiyama Taeko” in Laura Hein and Rebecca Jennison, eds., Imagination Without Borders: Feminist Artist Tomiyama Taeko and Social Responsibility, Ann Arbor: Center for Japanese Studies, The University of Michigan, 2010.